Looking for a book that will make you ugly cry worse the Kim Kardashian? Then today is your lucky day! They Both Die at the End will have you sobbing into the ice cream that you are emotionally eating. Okay, all kidding aside, this was one of the most beautiful, well-written stories I have ever read. I laughed and cried. My heart broke, mended, then broke again. Adam Silvera introduces us to two very different people. Mateo and Rufus, teenagers that both receive their alert and find one another via the Last Friend App. We then get the bittersweet pleasure of joining them on their journey together as they live the last day of their life to the fullest. Could you imagine getting a call notifying you that today is the last day of your life? Adam Silvera did a spectacular job at penning the emotions that would surge through you should you get that alert. The emotions for Mateo, Rufus and those around them radiated off of the pages. Mateo and Rufus are not the only stars of this novel. There is a winning secondary character cast that compliments the entire novel. Each one adding so much to the reading experience that makes this book a wonderful, complete package. Adam Silvera's writing is flawless and I am eager to dive into his previous work. I am an instant fan. He captured such raw intensity that made you feel as if you were right there, standing in the background, witnessing their stories with your own eyes. 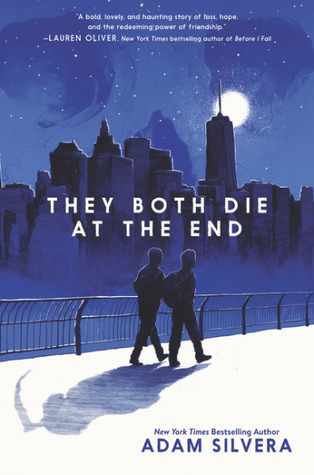 They Both Die at the End is, honestly, the most genius book title. Though you know the outcome, nothing will prepare you for the ache your heart will feel. Both heart-breaking yet incredibly beautiful. It's the ultimate carpe diem. I miss this book already. I will re-read this novel. Likely many times over, because I have made great friends in Rufus and Mateo, and I'll want to visit them from time to time. If you have not read They Both Die at the End that needs to be changed immediately! Though, be sure to hit up Costco and buy the biggest skid of Kleenex they have! You'll need it!